Fadaei Nezhad, Somayeh, Eshrati, Parastoo, Eshrati, Dorna. (1395). Developing a Conceptual Framework of Integrity in Urban Heritage Conservation. معماری و شهرسازی آرمان شهر, 9(16), 95-104. Somayeh Fadaei Nezhad; Parastoo Eshrati; Dorna Eshrati. "Developing a Conceptual Framework of Integrity in Urban Heritage Conservation". معماری و شهرسازی آرمان شهر, 9, 16, 1395, 95-104. Fadaei Nezhad, Somayeh, Eshrati, Parastoo, Eshrati, Dorna. (1395). 'Developing a Conceptual Framework of Integrity in Urban Heritage Conservation', معماری و شهرسازی آرمان شهر, 9(16), pp. 95-104. Fadaei Nezhad, Somayeh, Eshrati, Parastoo, Eshrati, Dorna. Developing a Conceptual Framework of Integrity in Urban Heritage Conservation. معماری و شهرسازی آرمان شهر, 1395; 9(16): 95-104. 1Assistant Professor of Architecture, School of Architecture, College of Fine Arts, University of Tehran, Tehran, Iran. 2M.Sc. in Urban Design, School of Architecture and Environmental Design, Iran University of Science and Technology, Tehran, Iran. The concept of integrity, as a factor of sustaining values and significance of cultural heritage, is considered to be a key element in the process of urban heritage conservation. 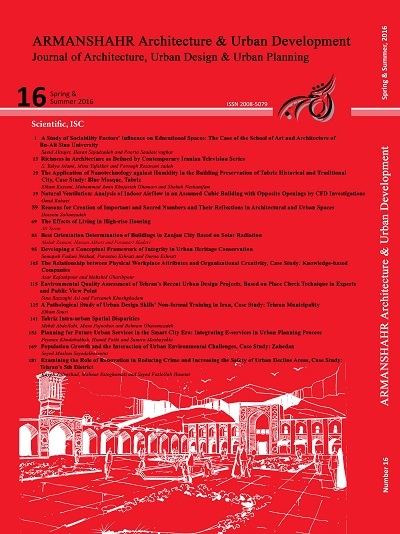 Review and analysis of documents, conventions and theories concerning the role of integrity in urban heritage conservation shows that in recent decades, the concept of integrity has attracted attention worldwide in the process of selection, assessment, and codification of the comprehensive conservation and management plan of urban heritage, particularly in the World Heritage sites. Currently, the UNESCO World Heritage Centre has a unique role among other scientific associations. In recent years, the World Heritage Center has put efforts into developing a conceptual framework in order to offer the criteria for evaluation, conservation and management of various types of heritage including the urban heritage. This research is carried with the aim of developing a conceptual framework for integrity in urban heritage conservation by determining the concepts related to integrity. The main question of this paper is that what are the dimensions, aspects, components and criteria of integrity within the domain of urban heritage conservation? Documents and related theories of integrity highlight the importance of conserving the integrity and stability of the cultural dimensions, besides natural dimensions, tangible and intangible aspects and intactness and wholeness components in the process of recognizing and conserving the integrity of place which are possible to be measured and evaluated by structural-historical integrity, functional-social integrity and visual-aesthetic integrity. The major contribution of this paper is to develop a conceptual framework for urban heritage conservation, applying all the above mentioned issues. Nations Educational, Scientific and Cultural Organization (UNESCO) and Madrid: Ediciones San Marcos, 52-55. Declaration of Jerusalem. (2006). International Workshop New Approaches to Urban Conservation. Jerusalem: Brigham Young University, 4-6 June 2006. Heritage, Available at: http://www.icomos.org/index. php/en/charters-and-texts (Accessed: May 2010). English Heritage. (2008). Conservation Principles:Policies and Guidance for the Sustainable Management of the Historic Environment, London: English Heritage. Rural Landscapes, Journal of Cultural Heritage. ICCROM. (2007). Sharing, Conservation, Decisions. ICCROM, Rome, Italy. Convention, Available at: http://icomos.org/index.php/ en/charters-and-texts. (Accessed: May 2010). ICOMOS. (1964). International Charter for theConservation and Restoration of Monuments and Sites (The Venice Charter), Available at: http://www.international.icomos.org/centre_documentation/chartes_ eng.htm. (Accessed: May 2008). Jokilehto, J. (2006). Considerations on Authenticity and Integrity in World Heritage Context. City & Time, 2 (1): 1. [Online] URL:http://www.ct.ceci-br.org. Expressed in Current International Doctrine. City & Time, 3 (3), 2. [Online] URL: http://www.ct.ceci-br.org. Rossler, M. (2008). Applying Authenticity to CulturalLandscapes, In Waite, Diana. (Ed. ), APT Bulletin (pp. 47-54), Vol. XXXIX, No.2-3, Published by Association for Preservation Technology International. Stovel, H. (2007). Effective Use of Authenticity and Integrity as World Heritage Qualifying Conditions. City & Time, 2 (3): 3. [Online] URL: http://www.ct.ceci-br.org. Talebian, M.H. (2005). The Role of Authenticity in Conservation of World Heritage Sites the Experiences from Dur-untash for Authenticity- based Conservation, Ph.D. Thesis, University of Tehran, College of Fine Arts, Faculty of Architecture. UNESCO World Heritage Centre and City of Vienna. (2005). Proceedings of the International Conference World Heritage and Contemporary Architecture – Managing the Historic Urban Landscape. Vienna: City of Vienna. UNESCO. (2005). Operational Guidelines for the Implementation of the World Heritage Convention, World Heritage Committee and World Heritage Centre. UNESCO. (2011). Recommendation on the HistoricUrban Landscape (Draft), adopted by the General Conference at its 36th session, Paris: UNESCO World Heritage Centre, 10 November 2011.